Tweet this: @avantisystems & @islsoftware integration automates every aspect of #print job into one #workflow. 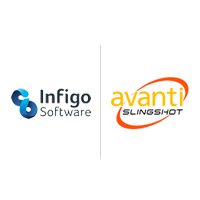 TORONTO, February 28, 2017 – Avanti Computer Systems Limited, a leading provider of Print MIS solutions, today announced the integration of the award-winning Avanti Slingshot Print MIS solution with the Catfish web-to-print platform from Infigo Software Limited. The first user of the newly-integrated solutions is the Print & Imaging Lab at Arizona State University, the in-house print provider at one of the largest U.S. universities. The newly-integrated solution allows customers of the lab, whether internal or external, to use the SaaS-based Infigo e-commerce platform to submit a print-ready file or compose the entire piece online. By integrating Infigo Catfish with Avanti Slingshot, it’s possible to automate every aspect of the print job into a single workflow, eliminating the need for human intervention. Functions such as job specification and submission, reporting, estimating, imposition, inventory management, scheduling, shipping and billing are automatically combined into a single, streamlined workflow. Very popular in the U.K and Europe, Infigo Catfish is a leading web-to-print platform, ideal for companies looking to expand their printing business online in both B2B and B2C environments. It’s an HTML5-based (SaaS) solution that can be customized and configured to address print buyers’ precise needs. Starting with Dscoop San Antonio, Infigo began an aggressive campaign to market its products to North American print providers leading to the company trebling its North American user base over the past year. ASU Web-to-Print Manager Chris Halkovic described ASU’s use of the solution in an interview by the popular print industry web news provider whattheythink.com. Visit Avanti Systems in booth 902 and Infigo Software in booth 113 at Dscoop (Phoenix, March 1-4). Additionally, both companies will offer demonstrations side-by-side at the HP exhibit.